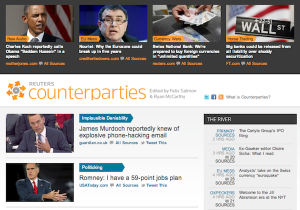 Counterparties was launched in 2011 by former Reuters financial blogger Felix Salmon as a subscription e-mail service and blog that linked to financial news and opinion pieces with an emphasis on content produced outside of the Reuters news ecosystem. “We believe that the best way to get people to come back is to send them away,” a mission statement posted on the Counterparties portal said. 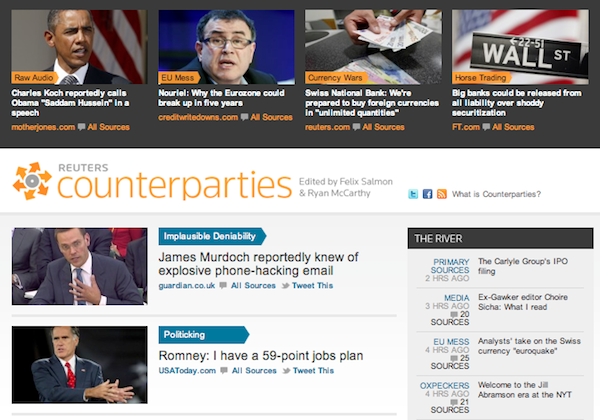 Journalist Ryan McCarthy joined Salmon as a contributor to Counterparties upon launch. Two other journalists, Shane Ferro and Ben Walsh, were later tapped to aggregate content for Counterparties. All four have since left Reuters for other news organizations. With no one left to produce content for the portal, Reuters blasted an e-mail to subscribers late last week announcing Counterparties would be shut down. “We will still be bringing you breaking business and markets news at Reuters.com and cutting-edge analysis in our blogs,” the Reuters memo said. The site is just the latest project shunned by Reuters over the past year. Last September, the company canceled its much-anticipated website relaunch. An internal memo revealed the project, code-named “Next,” had exceeded its budget and missed several deadlines since it was conceived in 2011. A mobile application was eventually launched from the project, though the browser portal never made it out of public beta. Following the cancellation of Next, Reuters executive Andrew Rashbass said the company would refocus its priority on the existing website. “The existing Reuters.com has many strengths, which I recognize coming from the outside, that perhaps people here take for granted,” he wrote in a memo. The shunned project saw the departure of Jim Roberts, an executive hired away from the New York Times just six months prior. Roberts is now an editor at the website Mashable. Salmon is now an editor at Fusion, a fledgling millennial-focused news network jointly operated by ABC-Disney and Univision. McCarthy has found a home at the Washington Post, while Walsh joined the Huffington Post as a business editor. Ferro is expected to join Business Insider around the beginning of October.